Today’s post is about more than good food. It’s also about some good news, and giving you a little preview into what you can expect from The Stout Sprout in the coming year… and it’s a big year! This fall our Stout Sprouts are entering Pre-K and 1st grade, respectively, and I’m now working in a new position that has me commuting in to Manhattan regularly. Kitchen time and writing time is now more limited than it has been in prior months, but we’ve been making the most of the time we do have together, visiting farmer’s markets, playing at the Jersey shore, and eking as much time out of our weekends together as we possibly can. Our crunched schedule also means that in addition to focusing on seasonal, kid-friendly dishes, we’re also focusing on convenient meals. Things we can make together and enjoy together without a crazy investment of time or ingredients. What this also means is that we have a backlog of easy weekend and weeknight recipes that make excellent use of the riot of fresh produce that summer has delivered. And while the farms and gardens are churning out juicy, ripe tomatoes, sweet summer corn, crisp bell peppers and cooling cucumbers, we’re busy putting it all to good use. 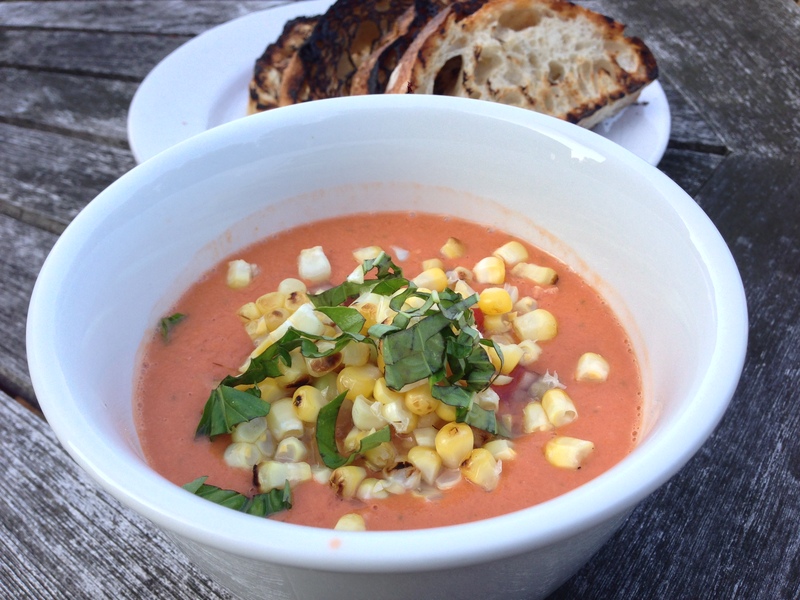 Take, for instance, one of my favorite summer suppers: gazpacho. Gazpacho is the kind of dish that uses all that market bounty. Refreshing and cooling, it’s vegetarian and vegan and, when served with a slice of hearty grilled bread, is still as satisfying as any protein-packed main dish. It comes together quickly and can be made hours in advance of mealtime. There is little real cooking required – just a bunch of chopping and a little blending (and in our case, a little bit of grilling). 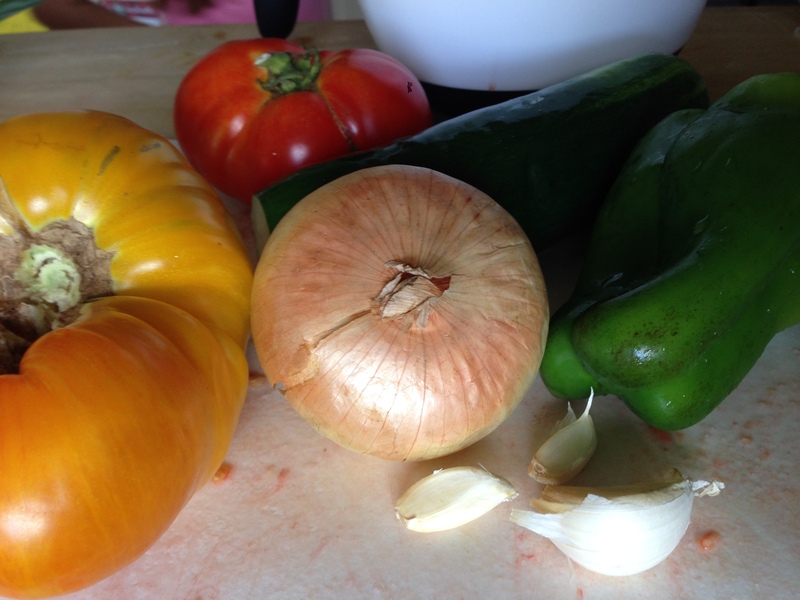 Making a good gazpacho is as easy as tossing a bunch of vegetables in the blender. Making a great gazpacho takes only a modicum more effort, employing tricks I first learned from this wonderful Cook’s Illustrated recipe for Creamy Gazpacho Andaluz: finely dice some of the vegetables, and add them back in to the pureed soup before serving. When pureeing, add in a slice of yeasty bread to create a creamy, hearty body to the soup. The addition of bread is what makes it beautifully Andalusian and, in my opinion, brings this gazpacho to life. The cuisine of that Spanish community, located in Southern Spain along the Mediterranean Sea, has been influenced by many different ethnicities. Gazpacho likely originated from Arab recipes for a soup of bread, oil, water and garlic. Once it reached Mediterranean shores, it morphed to have a tomato base and incorporate a lot of other regional vegetables. Don’t be shy with the salt, olive oil or vinegar that goes into this recipe. And allow the flavors to fully develop and mature by chilling the soup for at least an hour before serving it. 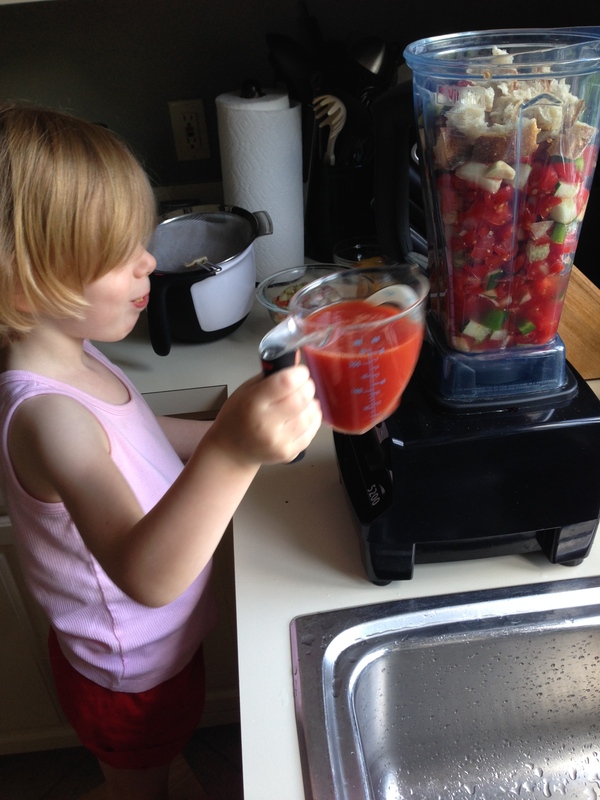 There are lots of great steps with which the kids can help, from chopping vegetables to working the blender. And, being a blended soup, the kids are much more likely to try it because no one vegetable really stands out. If anything, you may want to go easy on the garlic until you figure out the spice tolerance of the kids in your house. Ours liked this soup, but our youngest Sprout found it a little “too spicy” to finish the whole bowl. Give this one a try before summer is over. It’s my favorite, and hopefully will become one of yours, too. 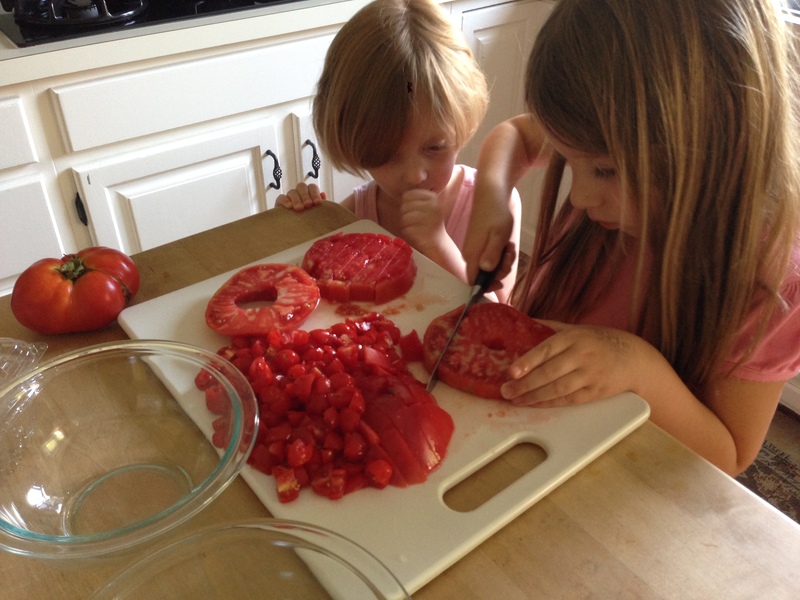 Roughly chop two of the three pounds of tomatoes, one of the two cucumbers, one-half of the onion, and the entire bell pepper and place in a large mixing bowl. Sprinkle these vegetables with 1 teaspoon of the salt and set aside. Finely dice the remaining one pound of tomatoes, one cucumber, and one-half onion. Sprinkle with ½ teaspoon salt and place in a fine mesh sieve set over a small mixing bowl to catch any extruded liquid. After about an hour, put the roughly chopped vegetables in the canister of a sturdy blender along with any of the extruded liquid from the finely-chopped veggies (transfer the finely chopped vegetables out of the sieve and into the small mixing bowl once you’ve added the liquid to the blender). Add the garlic, tomato juice and bread to the blender canister and begin to blend, working from a low speed up to liquify. Add the olive oil, vinegar, and lemon juice and continue to process. Once blended, pour the soup into a clean, large bowl. Mix in the reserved finely-diced vegetables and chill for at least an hour, or up to one day. When ready to serve, stir the soup to redistribute the diced vegetables and ladle into large bowls. 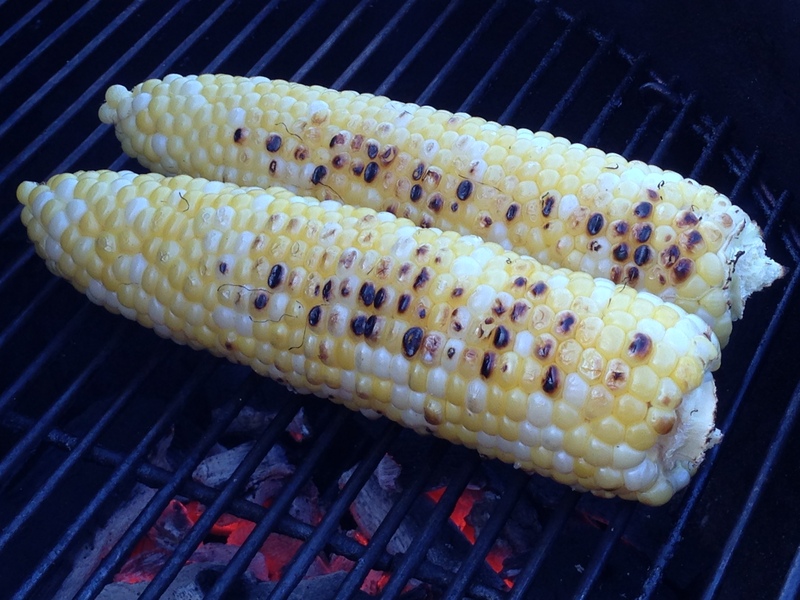 Top with a sprinkling of grilled corn kernels and some of the julianned basil. Season to taste with salt and pepper. Pass more vinegar separately if you or your guests like an extra splash of this savory addition in your soup, and serve with good-quality bread (grilled, if you have the time). Kid rating: three-and-a-half stars. Our Stout Sprouts loved helping out with this recipe…everything from choosing the veggies at the farmer’s market to chopping to blending. Daughter 1 finished her bowl when served, but Daughter 2 wasn’t crazy about the spicy flavor the raw garlic brought to the party. Next time, I may cut back on both that and the vinegar…allowing that to be passed separately. Parent rating: five stars. 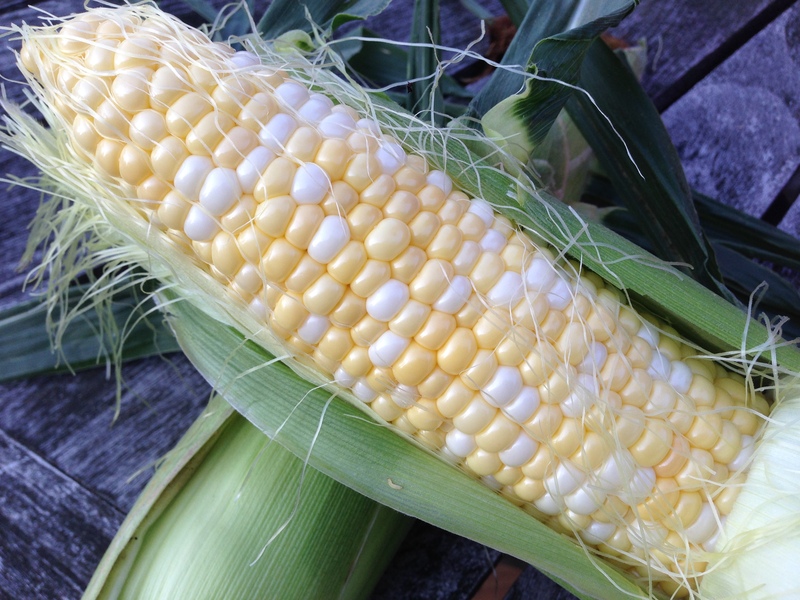 This is, as I said before, my favorite summertime dish. Love it. My husband may be a little less enthusiastic than I, but as we adopt a more vegetable-based diet it’s hard to deny the appeal of this dish. Easy to make, easy to eat. Summer in a bowl. Yum.